Cycles is an opportunity to review the many stages and phases of your life as a woman and to reweave and reframe whatever needs healing or greater wholeness. Cycles offers you a safe and sacred space to look at where you might have had your natural unfolding interrupted, where aspects of yourself may have been lost or forgotten, or where important changes in your life were left unhonoured. Join us in this two-day workshop that explores your relationship to Feminine archetypes. It is for women only and is a quiet contemplative piece in which you create your own level of challenge. This opportunity for self-exploration and discovery is a very personal adventure that provides the space to integrate your particular feminine life journey in all its aspects. As you examine how the archetypes and beliefs around them sit in your own psyche you can access places of comfort and discomfort, both personal and cultural. Visual and spoken pieces will support this personal immersion while each of us treads our own path through memory and evocation. Throughout our time together you are invited to deepen your relationship with change and transition and to forge a new empowered way of moving forward. To find an upcoming Cycles weekend or speak with a woman about Cycles click on Events or Connect with us. An amazing deep journey of connection with myself and the archetypes. The weekend was surprising for me in what showed up. Having the space for inner reflection and honouring allowed so much to be revealed. There was release, insights, incredible presence and healing. 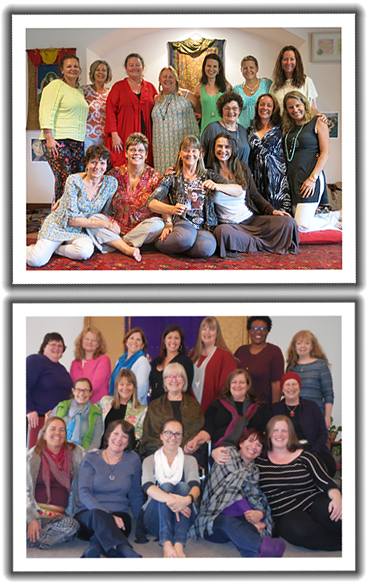 Cycles was facilitated by highly skilled and loving spiritual midwifes. This truly was an amazing weekend and I would highly recommend for all women to give themselves the opportunity to attend. Cycles, the name itself is a journey. What was a beautiful, easy weekend – simple in its approach and at times light-hearted – was facilitated with grace, knowledge and laughter. For all my adult life I had a phobia that had begun in my child/maiden years. After cycling through my maiden and the other archetypes of a woman I have found my phobia has gone. I no longer have the reactions either. The weekend proved for me a deep, transformative and healing journey. My learnings were precious and, amazingly, some transformations immediately tangible.Thank you for this work , I would recommend it to all women.